« Garden Update # 5 – Here Today, Gone Tomorrow! Photo snapped at 2:30 pm Pacific time at an altitude of 30,000 feet while we were descending towards San Jose, California on October 25th. 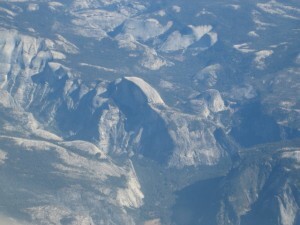 The lighting was just right to create good shadows to accentuate Half Dome in Yosemite National Park.